Orthodox economics operates within a hypothesized world of perfect competition in which perfect consumers and firms act to bring about supposedly optimal outcomes. The discrepancies between this model and the reality it claims to address are then attributed to particular imperfections in reality itself. 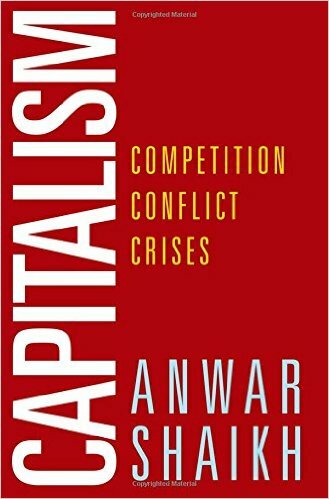 In Capitalism, Shaikh’s approach demonstrates that most of the central propositions of economic analysis can be derived without any reference to standard devices such as hyperrationality, optimization, perfect competition, perfect information, representative agents, or so-called rational expectations. In every case, Shaikh’s innovative theory is applied to modern empirical patterns and contrasted with neoclassical, Keynesian, and Post-Keynesian approaches to the same issues. Shaikh’s object of analysis is the economics of capitalism, and he explores the subject in this expansive light. This is how the classical economists, as well as Keynes and Kalecki, approached the issue. Anyone interested in capitalism and economics in general can gain a wealth of knowledge from this ground-breaking text.